Today I am taking a look at the Olight PL-Mini 2, a weapon light from Olight designed for compacts and subcompact pistols. Thanks to Skyben for sending this Pl-Mini 2 to me to check out and test at the range. Packaging for the Olight PL-Mini 2 is much like other recent Olight’s with a white high quality cardboard outer box. On the inside, you have a pull out tray covered by a cardboard cover that contains the manual and a right angle torx key. The light, charger and accessories come housed in a plastic form fitted container. Included accessories are the PL-Mini 2 itself, Olight magnetic charger (Special for the PL Mini lights), a metal 1913 rail piece (Glock is preinstalled), 2 extra screws, and a T6 Torx wrench. Skyben also includes 2 extras, a small little battery case for CR123 batteries, and a USB flash drive sized LED light. The light is built from anodized aluminium with a smooth fairly glossy finish. The rear left and right buttons are plastic, and designed to bet pulled down to actuate. Compared to the original PL-Mini the PL Mini 2 is shorter but a bit thicker in height. The big difference here is the mount. It has the same quick detach lever as the PL2 RL that when unlocked you have to then push on this actuator to expand left and right the attachment point, I like this and it adds additional security incase the quick detach was to come unlatched, the light wont drop off your pistol. The element that the PL Mini 2 adds is that in the unlocked position the mount section then slides forward and backwards allowing you to get the rear end of the light to fit a wider selection of firearms. For instance the original PL-Mini won’t fit on the rail section I have installed on my S&W Shield, the light is too long, but the PL-Mini 2 I am able to sift the light forward so that it will connect. For those of you wondering I am using a ReCover Tactical SHR9 Rail adapter, and it’s really a nice option for the shield, with super easy install. One thing to note is that there is No locktight on the screws that hold the adjustable rail section to the light. It hasn’t been a problem through my shooting the light but it’s something I might end up doing to just make sure they won’t ever come loose. I did decide to see if I could pry off the small rail section to see inside, and with a little force I was able. Between the two pieces there is a black silicone gasket, and inside there is a 130mAh battery. I was a little surprised to see the light is mostly potted with a clear silicone type material. I had no issues with durability, having shot about 300 rounds through it on two outings to the range, from 4 different guns in 3 different calibers, 9mm, 40 S&W and 45 ACP. To sum up the numbers the PL Mini 2 is shorter, but has more height and weighs slightly more due to the more complex mount system. This light uses the Cree XP-L HD LED in cool white. In comparison to the Original PL-Mini the tint in version 2 is a bit warmer, but with a slight green tint in my example. The reflector is a little larger due to the increased height of the light, and it seems to throw a bit larger beam. The light throws pretty well the reflector size, and for a weapon light this is what you want. 600 lumens on such a small platform will have a hard time dissipating heat and this is no different. It’s brightest mode only lasts 2-3 minutes, the good news is the step down is smooth and slow but significant. By the 11 minutes mark, the light is at about 10% relative output. It maintains this steadily for another 35 minutes before decreasing slowly down to almost nothing before it shut off at 100 minutes. The UI is very basic with essentially no options on this light. The buttons have basically one mode that either lock on if pressed quickly, or act in momentary if held down. There is no strobe on this light. Recharging happens via the magnetic olight charging system. The PL Mini 2 like the original use the special version of the charger, my guess this is to reduce the charging speed due to the small battery. Overall recharge time from shut off point was 52 minutes. Stepdowns are more gradual and slow, not big steps, but it’s initial 600 lumens only lasts 2-3 minutes. Holster Support – A few brands announced they will be making holsters for the lights, Olight still has a lot of work to do to catch up to the more established brands in the pistol light market for holster support. Clamp on the left hand side, when mounted easily catches a finger when going to turn it on. The PL-Mini 2 is almost a completely different light from the 1st generation. While they do similar things, the Mini 2 prioritizes it’s modularity to fit smaller compacts and subcompact pistols, and makes design decisions to accomplish this such increasing it’s height, to make it’s overall length shorter to better fit compact and subcompact framed pistols. As a weapon light it works well, I don’t have any complaints there, the magnetic recharging system is very convenient, and works well for the size. My two problems are the quick disconnect lever is a little too long and kind of covers the switch on that side. Left handed shooters would notice this the most or if you trigger the light activation with your off hand for right handed shooters. I think the design could be improved by at least making it round or perhaps coming up with another lever design that is smaller. The other main problem I see is holster support. There are a few manufactures that offer semi custom holsters but not many. Be prepared to be buying custom holsters if you decide to run this light as it’s just not widely supported like some other brands are, especially if you have an adapter rail like I do. As long as you know this going in it’s a nice little pistol light that works well in my testing. Today I have a review of the new Olight PL-2RL Baldr weapon light from Olight. This light takes the PL-2 which I reviewed last year and adds a red laser to the bottom of the light. A few things on the flashlight itself were improved upon and then the addition to the laser. Thanks to Olight for sending this to me to take a look at. Packaging is similar to Olight’s others from 2018. It’s a white cardboard box with texture, and a picture of the light printed on the outside. On the back it has stats about it and runtime specs. I prefer if Olight would relocate the SN/Barcode because when you pull the tab to open the package that piece comes loose. Accessories include the light itself, 2x CR123A batteries, small Hex wrench, and a 1913 rail piece (The Glock is preinstalled). If you don’t know the Glock rail is slightly smaller, it will work on a 1913 rail but move around more than is desired. This light is very similar in construction to the original PL-2 but with a laser module screwed on to the bottom. It’s built of aircraft grade aluminum and is pretty sturdy. The anodizing finish on the light looks the same but in my experience it and the lens clean up easier. I sprayed mine down with Ballistol, let it sit for about 15 minutes while cleaning other things and the powder residue on the front of the light and on the lens easily wiped off with a microfiber towel. My PL-2 was more difficult to clean. The buttons appear to be the same, they click from the side, not from the back, have a rubberized texture and are ambidextrous. The battery door has a tab to pull up and then it hinges up. This means you most likely will need to remove it from your weapon to swap batteries. Not a huge deal with the toolless mounting system on the PL-2RL. It has visible springs in the front nearest the lens, but the rear terminals are also spring loaded, just not visible. Not much movement in them. The mounting system has been improved on the PL-2RL. It still features a toolesss quick release lever which I really like. What’s new is this is now more spring loaded. In the unlocked position the light is very hard to shake off accidentally, if you push on it some you can get it to come off. To get it off you have to press in on the lever to expand the jaws a bit. This is definitely an improvement, the PL-2 would just drop free when the lever was in the unlock position, I could see if you were in a tactical situation how the lever may be caught on something and if that happened your light would fall free. With the new PL-2RL that is much less likely to occur. The light does have a bright yellow warning sticker about the laser that also features as the indicator for the modes. I wish this was done differently. I understand there is probably import/legal regulations regarding the laser, but I wish the mode indicators were laser engraved into the light as a more permanent fix. I find the yellow a bit distracting and it’s not very tactical. I think i’ll either cut the sticker and remove the bulk of the yellow part or use a sharpie or paint marker to make it black. This isn’t a small weapon light. The addition to the laser adds quite a bit of bulk to the light. On a full size pistol it’s ok, but on anything much smaller it’s borderline too big in my opinion. Length of the PL-2RL is 83mm, width is 36.5mm, depth is 48mm. Depth of the PL-2 was 30.5mm. Weight with batteries of the PL-2 is 116g. Weight with batteries of the PL-2RL is 140g an increase of 24 grams. It is IPX6 water rated so it should do fine in heavy rain or dropped in a puddle if removed quickly. It’s not a diving light. In my testing the light held a zero pretty well. I tested the light on a couple of Glock’s chambered in .45 ACP, 10mm, and 9mm. I also tested it on an AR9 pistol. We didn’t zero it on every firearm but we did on 10mm and AR9 and after the first few shots it held its position well. I know Olight had some initial issues with the PL-2 and 10mm, we didn’t have any issue after running it through a variety of rounds. To adjust zero there are two set screws near the laser part of the housing to set windage and elevation. An included Torx wrench does come with the light. One thing I would improve is when adjusting elevation and windage some clicks that you could either feel or hear would be useful, to improve the speed of adjustment. So you know each click is for example 1 MOA etc. You can zero it without shooting a round at home if you have your iron signs setup. Point your unloaded firearm in a safe direction, and zero the laser to your iron sights. The PL-2RL is advertised as producing 1200 lumens through a CREE XHP 35 HI LED in Cool White, however those are peak lumens. Like many high output flashlights the PL-2RL will step down in brightness to 400 Lumens after 1.5 minutes. The runtime is then an additional 100-105 minutes depending if the laser is on or off. In mode 2 when the light is on at a constant 400 lumens, runtime is increased to 105 or 120 minutes depending on if the laser is on or off. The lens is glass, with a plastic TIR style reflector. It creates a very hot center, minimizing spill. The Olight PL-2RL can use 2X CR123A or rechargeable RCR123A cells. If using the rechargeables runtime won’t be as long. This is one case where I would recommend using Primary batteries for longer shelf life, and because the runtimes will be longer due to the reduced capacity of the rechargeable batteries. The laser is a 5mW red laser that’s similar at 15 yards to a 3moa red dot. It’s running at a 645-655nm wavelength. Max runtime of laser only is 75 hours. Having the laser on doesn’t change runtime much of the XHP 35 HI LED. Olight lists the difference in mode 1 (1200 lumens, then 400 lumens after 1.5 minutes) of only 5 minutes if the laser is on. In mode 2 (Constant 400 lumens) the runtime difference with the laser on is 15 minutes less. The beamshots are identical to the PL-2. It’s a large hot center and throws decently well. The laser seems to be pretty centered in the middle of this beam. See my video for the examples. This light uses the same side to side toggle buttons as the PL-2 has. They work best to push from the side in. These work pretty much the same as the PL-2 for light uses. If you long press on either switch you get momentary on, if you quick press you get constant on, and if you click both together you gets strobe (Doesn’t work on laser only mode). On the back of the laser you have a 3 position selector switch, Left, Center and Right to select what combination of laser/light are on when the buttons are pressed.. When the selector switch is all the way to the left you get laser only. It will come on with either left or right button, and pinching each button at the same time doesn’t do anything in this mode. When the selector switch is in the center you get a Light + Laser option. In this mode when you pinch both switches together the light will strobe and the laser stays on all the time. When the selector switch is to the right you get only a light. In this mode the light works exactly like the PL-2, giving you momentary with a longer press or constant on with quick press. Rather then a big yellow warning sticker about the laser, I would prefer they laser engrave the 3 positions into the light itself as I think most people will remove the sticker. Engraving is also much more durable. The addition of the laser makes this quite large and heavier. Holster options will be limited, meaning you may have to have one custom made. Strobe interface isn’t ideal requiring pressing both buttons at the same time. I have enjoyed testing the Olight weapon lights, for me they have worked well on a variety of guns and platforms. The PL-2RL is a nice addition to the line. It’s downfall is it’s size, even on a full size pistol it’s pretty big.. For me it’s probably going to live on one of my AR platforms due to the size and having to get a custom holster. I like the addition of the laser, it makes aiming in the right conditions a little quicker and easier once you have it zeroed in. I like the Norse mythology name of the PL-2RL Baldr, the god of light. Each weapon light from Olight shows their growth in knowledge and experience in this segment of the industry and this is what you want to see to keep making better products. Olight needs to work with holster manufacturers in advance of a light release to have better support for their weapon lights if they want a wider adoption rate. I am interested to see what they come up with next. I wanted to show you the brand new special edition Olight i3T Cu in raw copper. This is a special edition of the Olight i3T I reviewed earlier in the year. Olight is having a flash sale for this light on Monday October 22nd from 1-3pm eastern during this time the light will be available for 25% off making it only about $24 plus a little for shipping. This is a great sale for a solid copper EDC light. I have only had the copper version for a few days and I like it alot. I kind of have a thing for raw copper and the aluminium version of this light gets a good amount of pocket time in my current EDC lineup. If you have not seen my review of the aluminum version of this light make sure you check it out on Youtube or Reddit. Let’s quickly go through the differences in the new copper edition. Only 10,000 will be made for sale worldwide, they are individually numbered so if you want one you better buy it now before it’s sold out. Solid raw copper. The light is solid copper inside and out, even the tail cap innards, This means the light will take on a great patina the more you use it. It came sealed in a protective bag inside the box so that it will be perfect when you first receive it. I am really looking forward to how the patina develops over time. Make sure you subscribe to my instagram. I will be showing progress of how it naturally progresses with the patina. You do pay some weight penalty for copper but since this is a small light I don’t think you will notice much in the pocket. The clip steel and is the same pattern as the aluminum light but this time it’s PVD coated in a brown/copper metallic finish. Right now when the light is bright and shiny there is some definite contrast here but as the light develops patina it will really blend in I think. Olight has also added 2 small raised area where the clip sets to give it a more snug secure fit to help it not rotate. Also changed are the color of the tail cap and button assembly. It’s also a copper brown finish. Lastly the O’Ring around the lens and inside the tail cap have been changed from the standard black to red. Outputs, UI, and the emitter in this light are the same as the aluminum version. The i3T Cu makes a nice EDC especially if you have a thing for copper, this is really easy light to pick up. Today I am looking at the new Olight S1R Baton II. While the name is a mouthful this small light means business. It’s just 2.4 inches tall but produces 1000 lumens on Turbo, has a magnetic tail and has recharging via the doc. Thanks to Olight sending this to me to take a look at the newest light in the Olight flagship line. Packaging follows other recent Olights. It’s a tall and narrow white textured cardboard box. Inside is a white branded plastic tray that holds the light. Underneath was a large yellow cardboard read me, telling you to remove the insulating film, suggesting to store the battery in an included battery keeper, and what all is inside. Included with the light is the light itself, the Olight dual direction pocket clip, a proprietary Olight IMR 16340 550mAh battery, new generation of the magnetic USB charger, a small plastic battery box, lanyard (With threading needle), and a brown suede bag. The S1R Baton II follows in a long line of well made production lights. The light is made from aluminium and anodized a smooth satin black. Starting at the back of the light we notice the recharging contacts for its magnetic recharging system. The outside silver rings are slightly raised, and the inner brass button is sunk in just a little. I did test for safety of this system with a bit of steel wool and didn’t have a fire starter on hand. This tail cap is magnetic and quite strong. It easily holds the weight of the light and is better against vibrations then some previous Olights. The tail section also has a hole drilled in it’s side to allow for a lanyard. Unlike on the original S1R Baton, on version 2 the tail and body tube are one machined piece of aluminum, and the only place the light seperates now is right below the head. The body tube has a new machined raised square with each side tapered in. It’s definitely more aggressive than the small flat squares before but nothing that should rip up a pocket. I like it quite a bit. Threads are small, well machined and greased. The head itself is pretty small, and inside features a pretty stiff brass spring. On the exterior writing is kept to a minimum, with just a small Olight logo, and opposite that the model number and serial number in small writing. The button is the same as others in the Baton series, It has a silicone cover, and has a small red LED in the center for indicating status. This is surrounded by a blue bezel. The front bezel of the light is reflective blue, and has engraved 1000 Lumens, CCT 6500k CRI 70. It features a TIR lens. I measured the length at 63mm and the maximum diameter in the head at 21mm. Weight with the battery and clip came to 51g. The S1R Baton II makes a pretty good EDC for a 16340 battery light. The thin side walls and clip make it a pretty easy carry in a front jean pocket in my opinion. In comparison the Olight S1 Mini Baton Is 54mm in length, 21mm in diameter, 43G with battery and clip, its tail isn’t rechargeable or nearly as strong magnetically though. 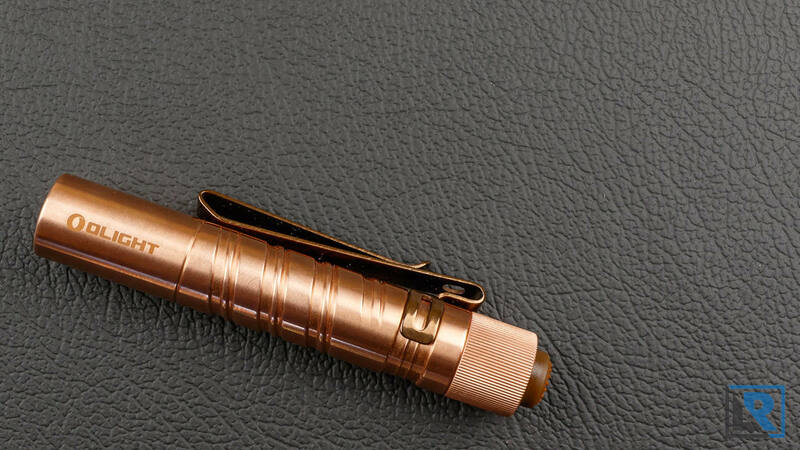 The Copper Smini Baton I have with battery is 54mm in length, 21mm in diameter but comes in at 72g with battery and clip due to copper being heavy. This light uses a Cree XM-L2 LED in cool white. It’s rated at 6500k with a CRI of 70. I don’t notice any cree rainbows, or odd color tints on mine. It features a TIR style optic and it’s no secret I like this style of optic on a short from factor EDC light like this. You get a sizeable hot spot that allows it to throw a useable amount and then you get a wide spill. For me and how I use an EDC light (Shorter durations) this is about perfect. Runtimes are about what I expected for a small light that leads off with saying it’s capable of 1000 lumens in turbo. Turbo mode doesn’t last that long, only about 1.8 minutes before it starts to slowly decrease fairly significantly to about 30% relative output. While that sounds like a lot it’s still quite a bit of useable light for about 28 minutes. Past this light steps down again pretty quickly to low mode. Total runtime from turbo on the included 550mAh battery was 65 minutes. Heat was well controlled for a small light. The S1R Baton II has the standard Olight UI many of us have come to know, and I like with the slower fades from off/on and between modes. From off, long press to activate moonlight mode at 0.5 lumens. To turn on in normal modes single click the switch, to change brightness level hold the button and the light will cycle through the 4 available modes lowest to highest. Double click to access turbo. Triple click to access strobe. The light also features memory mode for normal modes. Lockout can be accomplished when the light is off by pressing and holding the switch for 2 seconds until moonlight mode comes on and immediately shuts off. If you then press the button the red LED under the power button will come on to let you know your in lockout mode. To exit lockout press the button for about 1 second until moonlight mode stays on. Personally I will just give the body of the light a ¼ turn to mechanically lock it out. The light features a short 3 minute timer, and a longer 9 minute timer. If these are setup (See the included manual) the light will automatically shut off when the end of the timer is reached. Olight has an updated magnetic charger (MCC2) with the S1R Baton II. The main benefit of this charger is it’s faster. It now is capable of 1A charging. The charger is also capable of working with older versions of lights such as the S30R, or S2R. On those it was able to charge at a closer rate of .95A. Visually it’s a little different with the bottom and top having rounded edges. Gone is the LED indicator at the base of the charger and instead it has been replaced with a tiny LED on the bottom. I find the LED harder to see if it’s sitting on top, but better for night time bedlight charging due to less ambient lighting. On the S1R Baton II the charger didn’t charge at full speed the charger has printed on it. This due to the smaller capacity of the battery. You wouldn’t want to charge this 550mAh cell at AA for safety and cell longevity reasons. The battery has a plastic separator that stands up a little more and protects the positive terminal more then other olight batteries have had. The light is also capable of using a CR123 or other olight batteries although you won’t be able to recharge it in the light. My guess would be Olight will be rolling out updates to some of their other Baton series lights with this new charger over time. This is the 4th model of Olight magnetic chargers that I have, I think I need to start putting labels on them to keep them straight in my charging drawer.It would be nice if they had labels or color indicators on the lights/charges to help you out. I deliberately tried to short circuit the exposed charging contacts on this light with a bit of steel wool and had no ill effects. Small size, well built, strong magnet, great pocket clip. Proprietary battery, new to the this updated light. The older ORBC-163C06 also works in the light but won’t recharge. MCC2 charger with the LED on the bottom makes it harder to check status, I would prefer the charge status on the side. LED choice, while I don’t have major complaints against the XM-L2, I would love to see a neutral white or high CRI option, it would make this fantastic EDC in my opinion. The Olight S1R Baton II is a nice little EDC light with a lot of power for a short time. I think it’s a nice update. I especially like the new style of pocket clip and the new milling on the body. Olight does a good job with TIR reflectors creating attractive beam patterns for this style of light in my opinion. If you are needing a new EDC this is a nice option to choose. Today I have on my Review table the new Olight M1T Raider. This is a tactical style EDC light with 2 modes, a rear tail switch and upto 500 lumens out of a CR123 battery. In looks it is similar to the Olight I3T I reviewed last month. Thanks to Olight for sending this to me to take a look at. Packaging is the familiar white cardboard box that Olight has had on several of their recent releases. On the outside is a large picture of the light, and details are all on the back. The box has a pull tap on the top and you slide out the white tray that contains the light and accessories. In the package you get the light with the removable pocket clip preinstalled, a CR123A Olight branded battery (With plastic insulator that must be removed before use), a lanyard, and an instruction manual that in this case is only in english. I suspect that’s due to this light being released a bit earlier elsewhere in the world a little earlier this summer. The M1T is made of aircraft grade aluminum and is hard anodized a semi gloss black. The design is pretty similar to the Olight i3T but with some changes. Starting with the tail switch the top is a grippy rubber with a dimpled pattern. The side walls of the button are plastic, this means you need to actuate it more straight up and down not roll onto it from the side. I like this and think it helps prevent accidental activation. The tail cap has very fine knurling on it that seems to attract dust and dirt easily. The there very back there is a place for the small diameter lanyard to fit. Inside the tail cap instead of a spring, it has a spring loaded brass button. The body of the light has a helix style spiral like the i3T had but this time it has some straight knurling pressed in, I like the look of this and like the additional grip it provides. The head is rather simple, no additional heat sink or knurling on the body. The front Olight blue bezel has returned and this time with a DNA catcher of sorts on it. It’s not smooth but not sharp enough to damage you pocket. All branding and marking are on the head. The lens is recessed and a TIR style optic. You can see a few of the wires underneath the TIR optic which is uncustomary. Overall length 91mm, diameter 21mm. Weight is 65g with the included battery and clip. The light is IPX8 rated. This light uses a Luminus STT40 LED in cool white. The tint isn’t super cool, and more on the neutral side of things. As mentioned previously a TIR style optic sits on top. For my runtime tests I used an Olight branded 650mAh 16340 battery. The light ships with a Olight branded CR123A. Total runtime on the 650mAh battery was 70 minutes. Turbo lasted about 5 minutes and what was notable is that there really was not much sag in light output during this stage. The stop down was sharp and put output at about 55% relative output for the remainder of the 65 minute runtime. Runtime at the end was an abrupt shut off. This light doesn’t have Low Voltage Protection which is disappointing. The manual specifically says to use protected batteries (RCR1234 or 16340) if using rechargeables which to me means that it doesn’t have LVP. This is disappointing to me for a light in this price range and from a premium brand. However with this family of lights it does seem to be what Olight is doing. The UI of this light is a simple 2 mode only. It’s similar to Streamlight’s protac tactical series lights. The switch on the rear of the light works in momentary with a half press then can lock on in either of the two modes with a full press. By default the light comes on in high mode. To get to low from off you need to do a very fast double click. I find it easiest to do this in momentary then lock on if needed. It takes a little bit of practice to get right but once you do it’s easy to repeat. High modes is 500 lumens, and low is 5 lumens. Part of me wishes there was a medium mode of maybe 150 lumens which I find would be nice for EDC uses but it would complicate the UI a little for a tactical light. For a CR123A light it’s pretty slim, but it could be shorter. Either way I find it carries well in the pocket. The Olight blue bezel is back! If you want a tactical (High mode first) EDC light this is a pretty nice option. In essence this is a scaled up version of the Olight i3T. They use the same LED, same style lens and rear button, have a similar clip and exterior design. To me the most disappointing thing to me is the lack of Low Voltage Protection on a light of this price and from a premium manufacturer. Lack of LVP only matters if you are using it with rechargeable batteries but that’s what I do for EDC because it’s a lower cost of operation. As an EDC this carries nice, and is fairly deep in the pocket. It’s minimal diameter and it’s length isn’t too long. I like TIR style optics on EDC lights because I find the beam patterns to be useful. A good mix of flood and light throw. The UI on this light is good when you remember it’s tactical. While it starts on high it does have low but it takes a little practice to get to easily. Overall this is a nice tactical EDC option available from Olight. 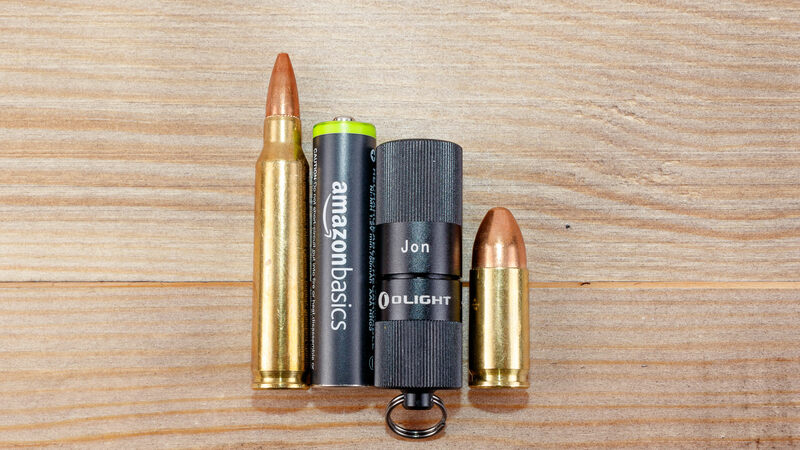 Olight has another new small flashlight to take a look at. Today I have the Olight i3T EOS. It’s a small AAA powered, tail switch light with 2 modes of illumination. In my review I plan to compare it to the Streamlight MicroStream because they are similar in size and operation as well as price. Thanks to Olight for sending this out to take a look at. The packaging is similar to other recent Olight products. It’s a white small cardbord box with relevant info on the sides and back. Inside is a plastic tray that holds the light and directions. This light doesn’t come with many extras only a preinstalled generic battery. The light is IPX8 water rated, and features a 5 year warranty. With battery it only weights 41g. The triple AAA style lights carry well when they have a good clip. Both lights here are contenders. I find diameter to be important especially for summer EDC when wearing thinner materials and less bulky clothes. The Olight i3T is a hair shorter The nthe Streamlight Microstream, mostly all down to the button. The Streamlight has a bit of a reputation for not having the best retention in the clip. The Olight doesn’t seem to have this problem so far in my 2 weeks of carry. Aside from outputs and modes the buttons are the biggest difference. The Streamlight has a more traditional rubber button and you can activate it by rollin in from the side. The Olight on the other hand has plastic sides on the button and a rubber top so it can only be activated from straight down. The Olight i3T is made of aluminum and has a gloss black anodizing on it. Starting at the tail the button stands proud and is easy to find. It has a studded rubber pattern on the very top, but the sides are hard plastic. This creates a very sturdy feel, and you have to be directly on top to activate it. This helps prevent side activation or rolling to activate. The tail is the only part that comes apart. It has straight cut knurling on it that is fine. Inside it’s a threaded brass insert with a gold colored spring. The body has a unique grip. It’s a spiral cut area that’s milled out in two little rows. It’s not a high grip design but it’s more then some of the competitors have and it’s something different. It won’t tear up your clothes and I like it. The head is pretty simple. It’s glued in place and has branding and model name and serial number on it. The lens is glass and under is a TIR style reflector and a small LED. The clip is a new design that is reversible and removable. In head down configuration it carries faily deep. It has ample area at either end for both thin and chick pants. Retention was good I had no issues on thin slick short pockets or thicker jean type pockets. The clip can also be used to attach the light the bill of a hat. The i3T usesa Philips Luxeon TX LED in cool white with a TIR reflector. This was the same LED used in the recent Olight i1R keychain light. It’s LED tint is not super cool, more of a warmer cool tint. Currently there are no plans to offer this in a warm or neutral tint. The beam of the i3T has a small hot center with a smooth fall off to spill. The Streamlight’s beam pattern is similar but the cut off is harder. At distance this harder cut off is more apparent and the Olights looks more even. In my comparison shot here the Streamlight is on the left and the Olight is on the right. It’s hard to make a fair comparison shot because of the lumen differences. The Olight is on Low, and the Streamlight is on in it’s one mode. This light is not compatible with lithium 10440 batteries officially according to the manual. However it does work with them if they are flat tops. Mine happen to be button tops. It is compatible with Alkaline, and rechargeable NiHM batteries officially which is what I have been using and recommend since there is no low voltage protection. I suspect the internals are very similar to the recent Olight i1R keychain light as it’s the same LED and reflector combo. For my runtime tests I used an Amazon Basics AAA rechargeable battery. I got a solid 10 minutes at the brightest setting (180 lumens) which was about 10 minutes before the light decreased in output to about 40% relative output over the next 10 minutes. At this point it ran for 40 minutes before continuing to drop off. Total runtime starting out in high was 70 minutes. The Olight i3T has a low mode as well at 5 lumens and they claim it will last for 16 hours. While the streamlight microstream has a longer output at 175 minutes it’s producing quite a bit less light during this time then compared to the olights High mode. The UI of the i3T is fairly simple. It starts off in low, and if you click (or momentary) again you get high output mode. If you change modes again within 2 seconds it will remember where you are, if longer then that the light will start again in low. The tail switch is capable of momentary with just a half press or constant on with a full press (audible click). 2 Mode UI but 3 modes would be nicer. No official 10440 compatibility due to lack of LVP. No signature Olight blue Bezel. The Olight i3T is a nice update to the 1 AAA options Olight has. I welcome the two mode button top design. The pocket clip has good retention and is deep enough. The top click mount button prevents side presses which helps prevent accidental activation in the pocket. The new milling on the body could be a bit more grippy in my opinion but I like the new look. I wish a neutral or warm tint LED was offered but I understand that adds cost and manufacture complications to service a smaller segment of the market. Overall I think the i3T is a nice light from Olight that should be popular to many and a good option for those looking for more output from a Streamlight Microstream or other similar lights. It can be purchased in the USA at OlightStore.com or at Amazon. I have reviewed several keychain style flashlights and due to size, I end up taking many of them off. This is where the Olight i1R is different. 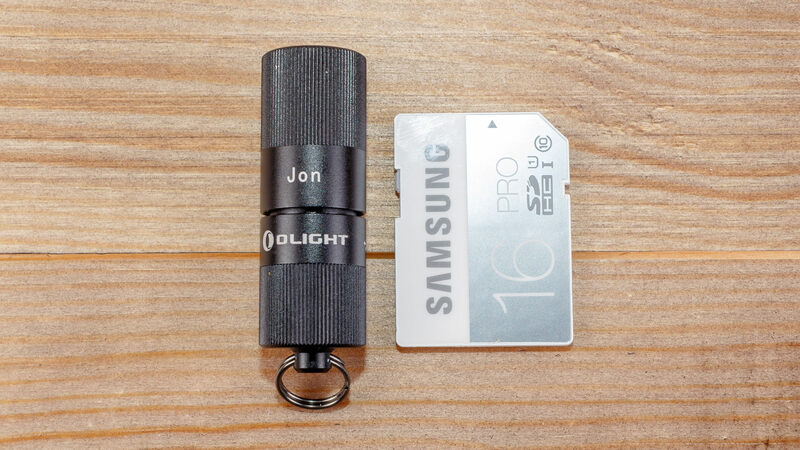 It’s seriously tiny yet is a completely functional bright light for brief uses offering 5 and 130 lumen modes. Thanks to Olight for providing this to me to take a look at. I am also doing a giveaway over on my Youtube channel an Olight i1R to a lucky viewer in North America. With such a small light it also has a small packaging. The i1R packaging follows the recent several Olights of being a white heavy cardboard box with a plastic tray inside. It contains the light itself with its built in battery and split ring already attached, a olight branded micro USB cable and the manual. This light is built from nicely machined black anodized aluminum. The light has a little bit of straight knurling on the head that provides good grip to twist the light on and off. Twist off the head completely and you get the microUSB connector for recharging. The light weights 0.42 ounces and is only 41mm in length. It’s also IPX-8 rated and I can attest it will survive a few drops from waist height onto ceramic flooring. Compare to a few other small lights and objects. On the back there is a simple diagram showing you which way to turn the light to make it work. From off, turn it clockwise and first you will get low, keep twisting and you get high. Turn to the light left until it turns off. The LED in use is a Philips Luxeon TX in a pleasant cool white. The beam pattern is smooth with no artifacts or hot spot. The battery is an internal and sealed lithium ion 10180. This is unfortunate. It’s also been mentioned that it doesn’t have low voltage protection over on Budget Light Forums. At this price point I can live with a sealed battery but I think it really needs LVP for protection. Overly discharging the cell once isn’t that dangerous but charging it again can be more dangerous. For a light that’s aimed at the mainstream consumer it’s something that it should really have. In Low mode of 5 lumens, Olight rates it as being able to produce light for 7 hours, and on high 130 lumens, it’s rated for 20 minutes. I made one discharge graph from high and it lasts a bit longer than 20 minutes. 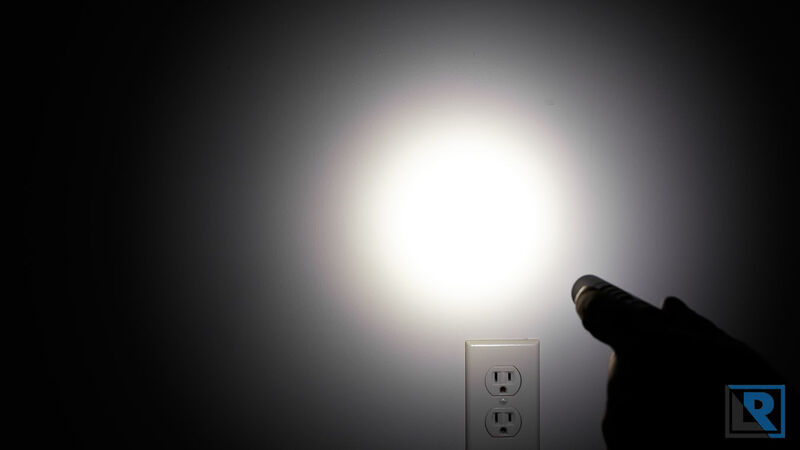 It creates a S curve as it discharges losing lumens slowly the entire time. I stopped my test at 30 minute mark and the battery measured 2.82V. Charging is accomplished via the built in microUSB port that can be found if you completely unscrew the head. There is a fairly bright red LED under the white plastic positive end that stays on until the light is charged when it turns green. Charging happens fairly slowly as you would expect from a small battery like this. In my test it took 65 minutes at 0.08A maximum speed. Olight has provided me a brand new i1R in the box that I will be giving away to a viewer on June 12th 2018 to my North American audience. I will be using Glem.io and have a link in the description below. To enter you will need to make sure you subscribe to my YouTube channel. I will have a few other ways you can increase your chances at winning in the description over on YouTube. 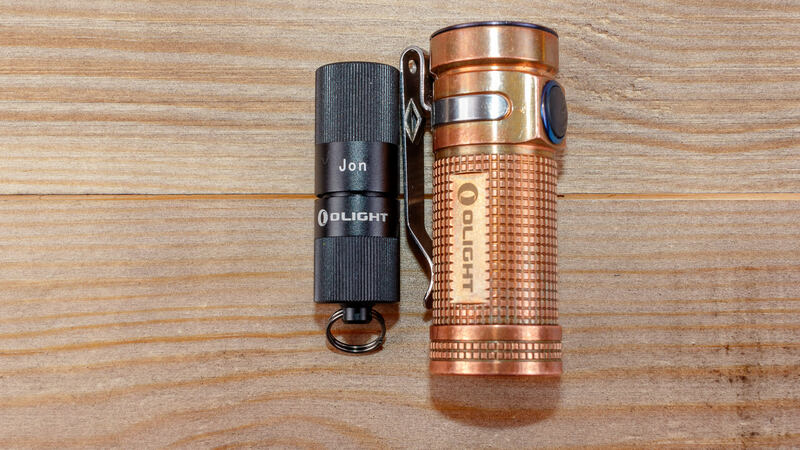 The Olight i1R is simple but effective keychain light that is really small and lightweight. It’s not exactly what enthusiasts would want since it lacks a removable battery and Low voltage protection, however at this price point of under $20 I think this will be a hit. My girlfriend wants it to replace the Nitecore Tiny she had had on her keys because it’s smaller and won’t activate as easily. I think for what it is this is a perfectly adequate light and plan to put it on my keychain for a backup light to use for short periods of time. I do think it should have LVP added and hopefully they are able to do that. Overall I like the Olight i1R because of it’s small size, relatively high output and affordable price. Check it out at the Olight Store. or on Amazon. The Olight H16 wave headlight, looks and shares many components with the HS2 that was released last year. The HS2 was a light designed for running, and the H16 Wave is designed more for every day normal use and features a no touch on/off ability. Thanks to Olight for sending this to me to review, let’s take a further look at the H16 Wave. The construction of the H16 is pretty similar to the HS2 but with a few changes. It appears the battery packs being used are the same in terms of design and capacity. They are encased in black plastic, have the 4 LED battery indicators and charge via microUSB with a silicone cover for the USB port. The straps are stretchy black elastic material with Olight printed on them and silver reflective aarrows. The cable the runs from the battery to the headlamp is one piece which differs from the HS2 where it was two pieces with a connection in the middle. It has a coil that’s allows the cable to stretch to adjust for different size heads. The Head of the light is made mostly of plastic except for a metal heatsync behind the LED’s. I believe it’s anodized aluminum and it has cooling fins. The front side is plastic and houses the two LED,s and the lenses. Below it is the single blue button covered with a silicon cover. The wave feature I believe is either side of this. The blue button does illuminate when the wave feature is turned on.The light is removable from the strap but the battery is not. There is a bit of foam on the back of the light housing that combined with the strap is plenty of padding. Overall I find this to be adjustable and comfortable as a headlamp to use for several hours due to it’s low weight and padding. Weight including strap and battery is 120 grams. Size of the headlamp portion is nearly square at 40mm by 39mm and 25mm in maximum thickness. 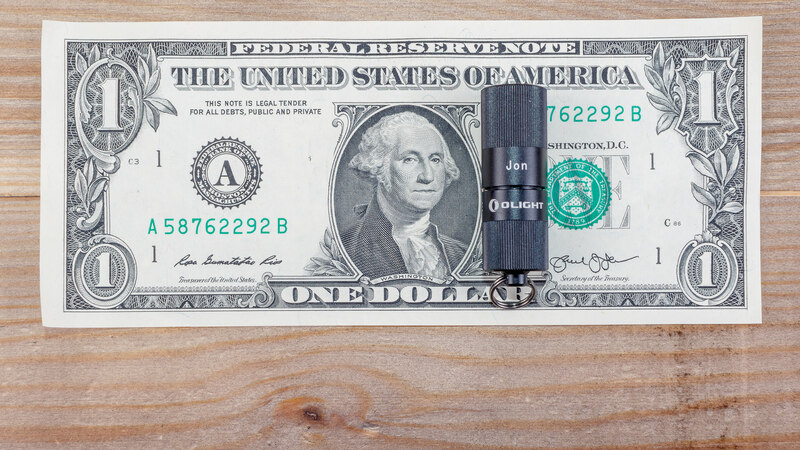 The H16 Wave uses two Cree XP-G3 LED’s in cool white and places two different optics in front of them. The LED’s work together and you can’t use one at a time like you could on the HS2. For the optics you have a traditional TIR style optic for a beam that throws a bit and has a large hotspot. Mine does exhibit some oddities that I can pick out on a white surface. The other optic is checkered diffuser which creates a flood beam. Runtimes on this light were good on the included 2000mAh battery pack. It was able to run starting out in High mode at 500 lumens for the 5 timed minutes and stepping down as the timer kicked in down to 350 lumens for another 130 minutes, and then down to medium at 100 lumens for about 15 minutes and then it went low at 5 Lumens for the remaining time. Total run time in my test was right at 140 minutes which is good in my opinion. The light does have 4 small LED on the battery pack that when battery check button is pressed alert you to the charge status. It also has an audible beeper that will beep when the battery hits 10% and it will continue beeping for 10 minutes. You can stop the beeping by pressing the battery check button. Charging the non removable battery is accomplished via microUSB. The light charges at a maximum of 1A and takes quite a while. From empty to 100% in my test it took just under 3 hours. The light will run while it’s charging but not on Turbo. The UI on the H16 Wave is simple, like most Olights. From off click the switch and you get High, click again and you get medium, click again and you get low. Starting in high is unfortunate, and I wish it started in low instead. The wave feature allows you to turn the light on and off via a wave of your hand in front of the light. You need to be reasonably close to the light for this to work. Closer then 2 inches. The wave feature only turns the light on or off, and doesn’t change the mode. I would love to see a mode of the light where you could configure Wave to change modes instead of just on or off. To enable the wave feature when the light is on you long press on the single button and the light will very briefly flicker. You do the same to turn it off. The wave feature will reset to a default of off if it isn’t used within 1 hour. The packaging is similar to Olight’s other 2018 products. It came in a white retail box that was narrow and long. The sides have a few bits of information and the back has most of it. Inside the light is housed in plastic tray with a clear lid. Included in this was the headlamp itself already attached to the strap, the manual, and a nice long microUSB cable. MSRP at the time of review is $59.99 with a 2 year warranty. If you have read my previous headlamp reviews, or watched my videos you know I like headlamps and think everyone should have one. The H16 is a slight rethink on the HS2 and I think it makes it better for general users. The wave feature works better than I expected it to and I can see some situations where your hands might be dirty and you want to turn on the headlamp. This would require thinking ahead though and having it already in that mode. Instead of using the wave for on and off I think it might be more useful as a way to go from one mode to another. Like other Olight headlamps I have reviewed this one is built well and I don’t expect problems. I would have preferred a neutral white or warm white option but Olight seems to prefer cool white on most all their products instead. This would be a good headlamp to add to a hiking pack, to use around the house or for all you home mechanics as I showed earlier. Pick it up on Amazon or Olight Store.